T.B.V. 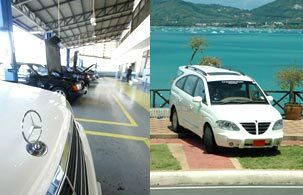 Auto Service, Ssangyong Automobile’s authorize dealer in Phuket, provides you with imported Mercedes-Benz technology from Germany. We offer Mercedes Benz’s spare parts, standard service centre, perfect garage, maintenance your car by professional technicians having over 15’s Mercedes-Benz repairing experience and the best after sales service. Touch the thrill with Ssangyong of Stavic, Rexton and Kyron. Feel exhilarating freedom with Ssangyong Stavic.The multi-purpose vehicle with luxury presence in a dashing supports 11 seats. It attracts you at first grance with Mercedes-Benz’s engine 2,700 cc, common rail turbo- diesel Xdi 270, German technology delivering 165 horsepower, fuel consumption 12.50km./ l., automatic 5 speed T-Tnonic and suspension system with double wishbone suspension in front, multi-link suspension in rear. We offer in price of a million plus. Belong the luxury vehicle at T.B.V. Auto Service. Stavic SV 270 is designed to automatically adjust for suiting conditions on or off the road. You will impress at the first glance with Neo Fusion style. The lower control arm provides wishbone suspension in front, multi-link suspension in rear and coil springs. Advance technology of Mercedes-Benz from Germany offers a pleasant ride. The multi-purpose vehicle with high quality offers 11 seats. Thrill your heart with the overall economical car. Assure with Diesel Turbo Intercooler Common Rail 2,700 cc. Cranks out 165ps and maximize torque in virtually all rpm ranges. Only 12.50km. /l. of fuel consumption. Touch automatic 5 speed T-Tnonic from Mercedes-Benz technology from Germany. : 34.7 kg-m @ 2,400 rpm. Warranty: 3 years or 100,000 km. Free Maintenance 1,000 km. / 10,000 km.